This classically designed Large Basketball Stand is perfect for backyard athletes! 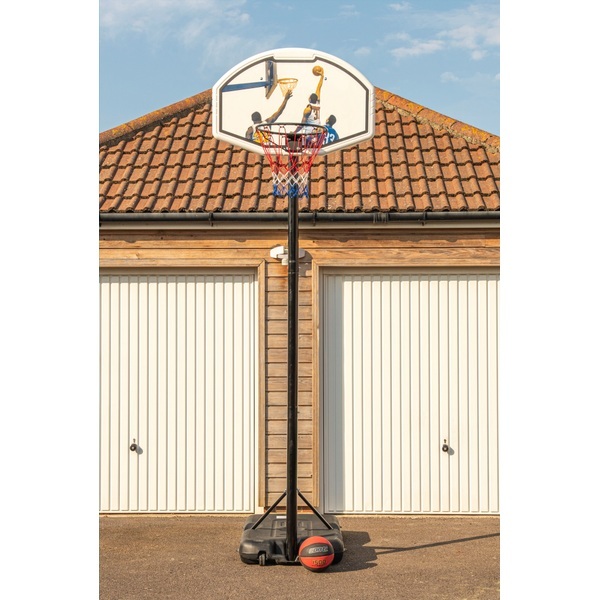 Kids and adults alike will enjoy hours of fun honing their basketball skills with this stand, which can extend up to a height of 10ft. The polypropylene injected backboard is designed to withstand the high impact shots of fast-paced play, while the 45cm rim fits standard sized basketballs and is made from solid steel for strength and durability. The height of the Large Basketball Stand can be adjusted from 227cm (7.5ft) to 305cm (10ft), so players can adapt the stand to suit their height or increase the level of challenge. The Large Basketball Stand features sporty styling, with a black stand, rim and base, a white backboard with border detailing and action-packed basketball graphics, and a net in red, white and blue. Whether you’re shooting some hoops as a family or having friends over for an energetic basketball match, this basketball stand is perfect for getting you and the kids outdoors and activ. You can improve the stability and security of this Large Basketball Stand substantially by filling the base with up to 175kg of sand (sand sold separately). This greatly reduces the risk of it tipping during enthusiastic play or windy weather.